Decorate your life and home with the OakHaomie Fairy Lights. These lights look like many beautiful fire flies, and the copper wire is extra flexible, You can decorate teenager or girls 's rooms to enjoy ambience of relaxing, decorate your wedding to memorize your important and romantic moment, decorate it in restaurant or shop, create welcome feeling, customers will be attracted by the twinkle String Lights,walk into shop or restaurant, stay longer, enjoy their commodity or food and love your shop or restaurant. You can also decorate your party, around wreaths, trees, flowers, and almost everything else. 6 hours on and 18 hours off per day, The ordinary battery can be continue used for 4 days, 6hours each day . The twinkle mode is chasing/flash, It's a positive and negative flicker. Its enameled silvery copper wire and low current ensures that the silvery copper wire is insulated and won't be overheat. You and your family can fully enjoy the lights without worrying about being hurt. Only the copper wire parts are waterproof and can be soaked into water; battery case is not waterproof and better be kept away from water. The battery box is NOT waterproof. To change battery, just use a screwdriver to open the battery case and make sure you put the batteries with the correct position. Timer Lights, These led lights now come with a 3 mode fairy light!! One of a kind , It comes with the option of a steady on, flash/twinkle, and then a 6 hour timer!!! This is a more convenient fairy light for buyers. 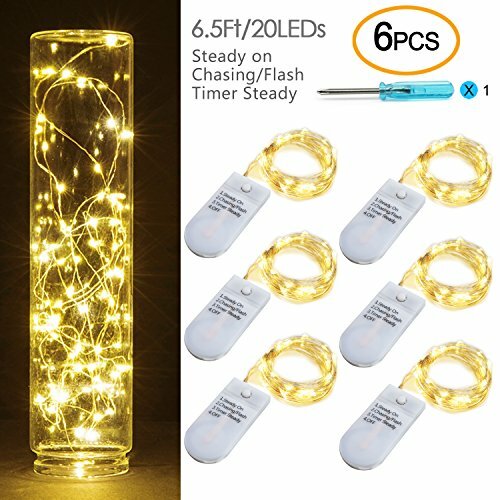 Very good design tools:6pcs lights per packing,battery compartment extension cord is 0.7ft,each light is with 6.5 feet flexible thin copper wire with 20pcs bright micro leds. Warm White (2600-2800K),They glint in the dark, For your patio, deck, front porch, child's bedroom,Festival, Floral Decoration,Wedding,and Party. And the copper wire disappeared into the night, Leaving only light. Each light is included 2pcs 2032 lithium cells, The battery box is with one switch,simply switch on the lights and enjoy these amazing moon lights. Waterpoof - Ultra Thin, Bendable but Sturdy Wire with LED Lights is Totally Submersible，the copper wire part into water to achieve amazing lighting effects, Not included battery. If you have any questions about this product by OakHaomie, contact us by completing and submitting the form below. If you are looking for a specif part number, please include it with your message.